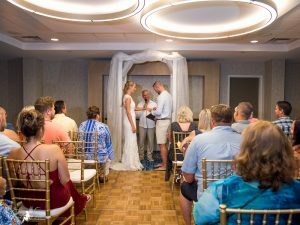 Rachel and Kyle came all the way from Ohio and chose the beautiful Hilton Clearwater Beach as the Venue for their destination wedding ceremony in early September. While the weather did not cooperate, the wedding was still a beautiful representation of their love. Rachel looked amazing as she was escorted down the aisle by father and mother to join Kyle under their wedding arch. In front of their family and friends, the couple shared their vows, exchanged rings, and were pronounced husband and wife by Rev. Rick Lackore of Sensational Ceremonies. DJ Services were provided by Eric with Grant Hemond and Associates, flowers and décor provided by For Better For Less, and videography provided by Hearts Video. Venue Coordination provided by Brooke and the rest of the wonderful staff at the Hilton and wedding event coordination provided by Megan and her team with Confetti Events. Special thanks to Wedding Photographer Tammy with True Love Photography for providing this beautiful photo as Kyle shared his ring vows with Rachel. Congratulations to the new Mr. and Mrs. Kyle Girton!